Try this experiment: fill a small tub with water. Gather a few materials from around your house like a paper clip, a penny and a wooden block. Which objects do you think will sink? Which will float? Will the bigger objects sink, while the smaller objects float? Place the objects on the water and find out. Were you right? It seems logical that bigger objects should sink while smaller objects float, but this isn’t always true. Objects with tightly packed molecules are denser and sink.Objects with more loosely packed molecules are less dense and float. Whether an object sinks or floats depends on its density. Everything is made of molecules. Molecules are tiny particles that can only be seen with a microscope. Some objects have molecules that are packed closely together. Others have molecules that are packed more loosely. This is density. Objects with tightly packed molecules are denser and sink. A paper clip or a penny is dense. Objects with more loosely packed molecules are less dense and float. Wood, cork or sponges float. Liquids vary in their density too. Try mixing corn syrup, oil and water together. The corn syrup sinks to the bottom because it is the densest. The water is in the middle and the oil floats to the top because it is the lightest. The shape of an object can also determine if it sinks or floats. A ball of clay sinks right away. However, if you flatten the clay out into the shape of a raft, it floats. Objects filled with air also float. Try mixing corn syrup, oil and water together. 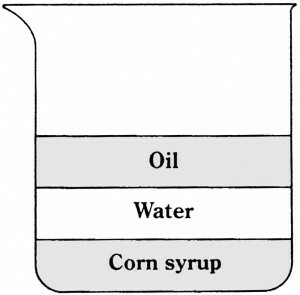 The corn syrup sinks to the bottom because it is the densest. The water is in the middle and the oil floats to the top because it is the lightest. The objects that are air filled also float. A video explaining why some things float. Question: Do things float better in salt water? Answer: Salt water is denser than freshwater, so things do float better. 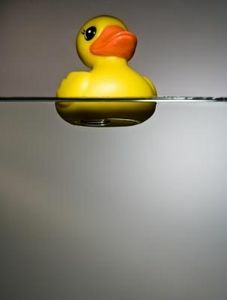 Enjoyed the Easy Science for Kids Website all about Sink and Float info? Take the FREE & fun all about Sink and Float quiz and download FREE Sink and Float worksheet for kids. For lengthy info click here. Declan, Tobin. " 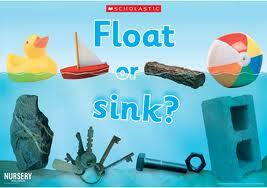 Facts About Sink and Float - Easy Science For Kids ." Easy Science for Kids, Apr 2019. Web. 21 Apr 2019. < https://easyscienceforkids.com/all-about-sink-and-float/ >.